Let's talk wellness... ...you, me, TODOS. Restricting food intake and maintaining a consistent workout regimen requires so much discipline, energy, not to mention time. Wouldn’t it be a dream come true to lose weight without putting any effort? Well, recent scientific research has found that this dream might be possible because of brown fat. What is brown fat, and how is it different from “regular” fat? There are two types of fat cells: white fat cells and brown fat cells. White fat is the unwanted fat that we try to shed when we see it in excess. While it is the undesirable fat that makes our jeans from last year too difficult to put on, it does play important roles in our bodies. It is a metabolic organ that stores energy, cushions and protects our organs, acts as a thermal insulator, and contains important hormone receptors and enzymatic machinery, etc. Brown fat, on the other hand, dissipates chemical energy from fatty acids and sugars into heat. Yes, you understood correctly -- while white fat stores energy, brown fat burns energy!!! What makes brown fat, brown? Brown fat gets its colour because it is unusually rich in mitochondria. Most mitochondria generate energy from the food we eat. We have lots of them in our muscles. Said that, mitochondria in brown fat differ from those in muscle cells. This is because muscle cell mitochondria break up organic molecules from the food we eat through a process of coupling reactions that convert it to ATP -- our bodies’ fuel. Brown fat mitochondria are uncoupled from ATP production through the action of a specific uncoupling protein called UCP1. UCP1 induces proton leak across the inner mitochondrial membrane, generating heat instead of converting it into ATP. 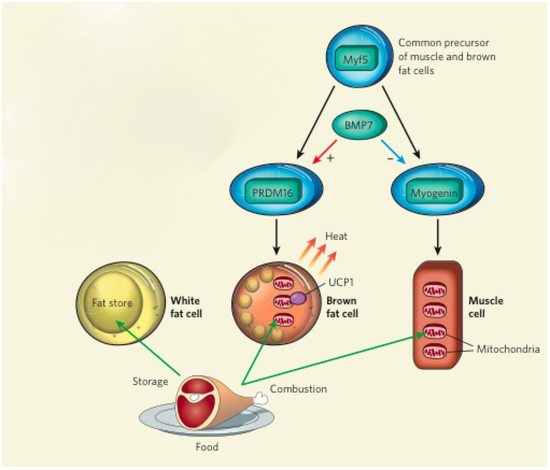 In short, brown fat mitochondria “waste” energy by releasing it as heat. Until recently, it was believed that only rodents, hibernating animals and human infants had brown fat. Babies are born with a small amount of brown fat at the back of their neck and kidneys, which was thought to disappear by the third week after birth. In the past decade, however, scientists have discovered the presence of brown fat in adult humans and an evident relationship between brown fat and energy expenditure. Lean adults have been found to have more genes that express brown fat, while obese patients have little to none. In 2009, several studies exploring the presence, distribution and activity of brown fat in both lean and obese subjects were published. These studies found that brown fat activity increases in cold temperatures and is negatively correlated with BMI and age. The finding that brown fat activity is present in adult humans is of direct relevance to fighting the obesity epidemic. Molecular studies to understand the precise mechanism of action and genetic expression of brown fat are underway. In the last several years, several models illustrating this have been proposed. Dr. Patrick Seale and Dr. Bruce Spiegalman from Harvard University discovered that brown fat cells originate from pre-differentiated muscle cells. And last year, Dr. Fawaz Haj, professor at University of California, Davis, made an important discovery marking the link between the regulation of insulin signalling and brown fat cells through an enzyme called protein tyrosine phosphatase 1B (PTP1B). Of note, PTP1B is a physiological regulator of glucose homeostasis and adiposity and is a drug target for the treatment of obesity and diabetes. 2. Cypess, A M. "Identification and Importance of Brown Adipose Tissue in Adult Humans". 2009. The New England Journal of Medicine. 360 (15): 1509. 3. Himms-Hagen, Jean. "Does Brown Adipose Tissue (BAT) Have a Role in the Physiology or Treatment of Human Obesity?" 2001. Reviews in Endocrine & Metabolic Disorders. 2 (4): 395-401. 4. Kajimura S., Seale P., Cooper M.P., Ruas J.L., Chin S., et al. "Regulation of the brown and white fat gene programs through a PRDM16/CtBP transcriptional complex". 2008. Genes and Development. 22 (10): 1397-1409. 5. Krauss S, CY Zhang, and BB Lowell. "The mitochondrial uncoupling-protein homologues". 2005. Nature Reviews. Molecular Cell Biology. 6 (3): 248-61. 6. P Seale, Kajimura S, K Kubota, E Lunsford, JV Frangioni, SP Gygi, and BM Spiegelman. "Initiation of myoblast to brown fat switch by a PRDM16-C/EBP-beta transcriptional complex". 2009. Nature. 460 (7259): 1154-8. 7. Matsuo K, A Bettaieb, N Nagata, I Matsuo, H Keilhack, and FG Haj. "Regulation of brown fat adipogenesis by protein tyrosine phosphatase 1B." 2001. PloS One. 6 (1). 8. Sell H, Y Deshaies, and D Richard. "The brown adipocyte: update on its metabolic role". The International Journal of Biochemistry & Cell Biology. 2004. 36 (11): 2098-104. 9. van Marken Lichtenbelt WD, JW Vanhommerig, NM Smulders, JM Drossaerts, GJ Kemerink, ND Bouvy, P Schrauwen, and GJ Teule. "Cold-activated brown adipose tissue in healthy men". 2009, The New England Journal of Medicine. 360 (15): 1500-8.